The global athletic footwear and apparel company has recently launched its Gigi Club C Melted Metal sneakers at Amazon India Fashion Week Spring Summer'18. Adding to the uber chic collection of the Reebok Classic range, the brand unveiled its new Gigi Club C Melted Metal sneakers, which was designed in collaboration with global brand ambassador Gigi Hadid. The shoes combine comfort and class for the ultimate athleisure look. Renowned designers Nida Mahmood, Shivan and Narresh and Urvashi Kaur among others have given thumbs up as the shoe redefines glamour with a twist. Senior Director Reebok India, Silvia Tallon said, "Reebok has been synonymous with stylish comfort and every product innovation reiterates the same. Earlier this year, the brand launched products in the classic and fitness arena endorsed by brand ambassador Gigi Hadid which soon became global favorites." "Melted Metal is a new offering from the same range, and the excitement at the launch makes us believe it will be received with the same love and enthusiasm," Tallon added. 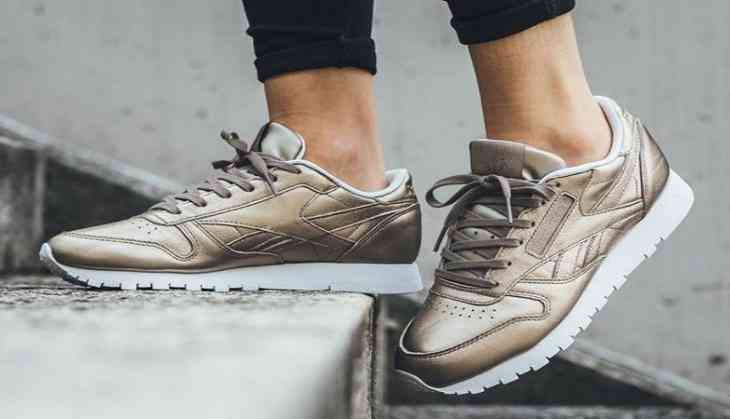 The Club C Melted Metal sneakers feature the iconic Reebok silhouette with metallic leather upper that makes these sneakers the perfect cross between edgy and feminine. They also feature a low-cut design, an EVA midsole and a rubber cupsole for a sure step each and every time. Designer Nida Mahmood said, "The shoe is beautiful and comfortable, I love the crack surface. It has a subtle sheen and Rose Golden is my favorite colour."